Lacey began her specials career with a bang in Ventura, CA with Bob Franklin handling. She took Grand Champion Select on Friday, BOV on Saturday and Sunday. Yeah Bob and Lacey!!! Thank you Judge Basset for finding Lacey in stiff competition! Lacey is a champion! The 5 point major finished her! Thank you Judge Basset! Welcome to Rambling Starz Kennel. Our Kennel consists of AKC registered chihuahuas, with our focus on breeding show dogs for myself and granddaughters to show. I get emails from friends who would like to keep up with me, my granddaughters, and our dogs, therefore we have put up a new web page. 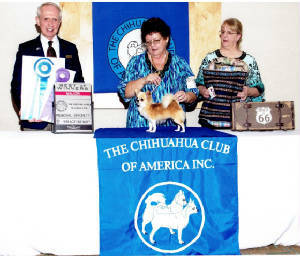 The Rambling Starz Kennel is dedicated to showing, loving, and breeding chihuahuas that are as close to the AKC standard as is possible to get. 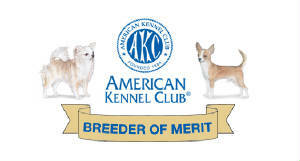 We have attained Breeder of Merit Status with the AKC, and are in the process of having our breeding stock "CHIC'd", with all the appropriate health testing. Our males are DNA tested. You will find our dogs happy, healthy, and socialized. We take as much pride in placing a happy healthy pet in a loving home as we do in taking a show prospect into the ring. Enjoy as you enter the Rambling Starz Kennel website. If we are at a show in your area, stop by, we would love to introduce you to our dogs and discuss the breed and our show dogs with you! We are very proud of our granddaughters and our dogs. Hey! Really great news! 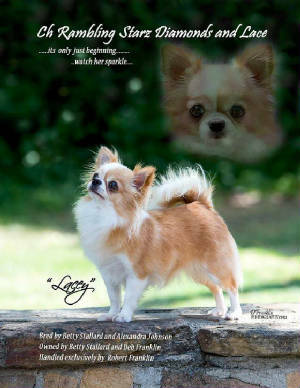 The new Chihuahua book is available. Our webpage for it is available at http://www.ramblingstarzkennel.com/thechihuahua/. Order online at xlibris.com/bookstore or at amazon.com and other online distributors. 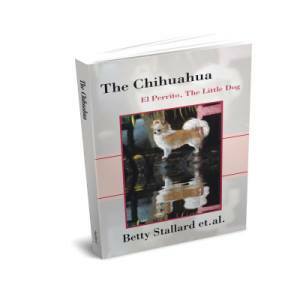 The name if the book is The Chihuahua: El Perrito, the Little Dog. The soft cover is $19.99, the hard cover is $29.99 and the ebook is $3.99. get it orders@xlibris.com book # 138984. I don't have to be nasty, I can just say, "Bless your heart!"